I was first introduced to this website by a university professor of mine during a post-graduate class on curriculum design, and I’ve kept coming back to it every once in a while. 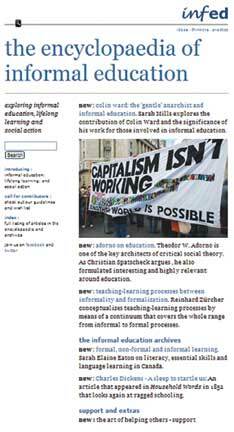 What I like about this encyclopaedia of informal education is that it brings together a wealth of information and insight in accessible language. While it would certainly interest teachers, teacher educators, and students of education, it also promises to be of value to other readers looking for a simple, uncluttered exposition on ‘key ideas, practices and thinkers’. Those are the three categories under which the encyclopaedia is organized. The offerings here extend beyond informal education to the fields of lifelong learning as well as social action. Since there is so much available on the Internet, credibility is definitely a concern. It helps to know that www.infed.org is run by YMCA George Williams College, London. A quick look at a random selection of entries would assure you that a great amount of thought and research has gone into the building of this fabulous resource. All entries are accompanied by a bibliography; so you can trace back original sources and find avenues to read up more. They also welcome contributions, in case you feel inspired to add to the existing set of resources. The subject areas they need help with are listed out on the website, so you can figure out where to chip in. The author works with the Kabir Project, Bangalore, and runs an online group called People in Education. He may be reached at chintan.backups@gmail.com.